Tony Blair came to Johannesburg last week. He was part of the Discovery Leadership Summit, hosted by Discovery Invest, and as you might expect he was the headline act. Tony Blair on leadership: now that would be an interesting lecture, if you could afford the high fee to attend (just over a quarter of the monthly take-home pay of your average South African academic). As it happens in South Africa’s thickly political society, Archbishop Tutu, scheduled to appear at the summit as well, pulled out dramatically and at the last minute. He was unable to share a platform, he said, with the former UK Prime Minister given his ‘morally indefensible’ invasion of Iraq. Tutu’s moral stand also had the strategic political objective of refocusing attention on a war that many in South Africa have forgotten in our parochial obsession with our tangled society. On the day of Blair’s speech, protestors demonstrated outside the Sandton Convention Centre and grabbed headlines to the chagrin of the conference organisers (who, it must be said, remained graceful throughout). Some of those protestors hoped to make a citizen’s arrest of Blair on the grounds that he was a war criminal. They did not get close, as security was amped up. 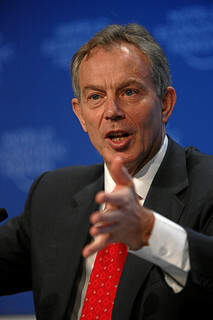 And although I sat two feet behind Blair at the taping of a BBC debate on poverty, I did not feel moved to put my hand on his shoulder as the viral email explaining how to effect a citizen’s arrest advised; see http://www.arrestblair.org/. Neither the bounty of over 500 GBP, nor the reassurance that my motives for the arrest did not matter, tempted me. I like the politics of outrage as much as the next leftist, but I prefer thoughtful debate, when all is said and done.I agree with Tutu that Blair’s war was based on slender evidence, driven by misinformation and an almost blind obsession with “following through” on his conviction (not to mention his commitment to President Bush) that the war should proceed. I would even confess to a visceral dislike of the smarmy mode of politics that Blair epitomizes. By contrast, I have admired Tutu for as long as I can remember and as a student I sat at his feet as he took on the apartheid government. Most recently, I supported his excoriation of the current government of South Africa for not allowing the Dalai Lama to join in Tutu’s 80th birthday celebrations. But it seems to me that Tutu missed an opportunity to engage with Blair in Johannesburg, and even to embarrass him, if that was the point. 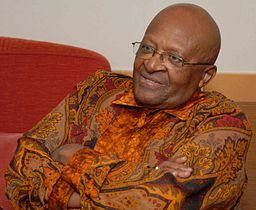 The enormous media coverage of Tutu’s action focused on whether Tutu was justified or not in boycotting the Discovery Leadership Summit, rather than on the causes of and justifications for the war. Should a small elite, even if it is elected, make world- shattering decisions? And what about Blair’s notorious and repeated retort when questioned about Iraq that he will not apologize for removing a dictator: will he apologize then for supporting Gaddafi and Assad? Tutu might even have opened a serious discussion of how we define “war criminals.” But the chance has passed, the Blair machine has moved on to its next engagement and all we have to celebrate is that the protesters did not get beaten up by the police. By the way, if you are wondering what Blair had to say about leadership: not much. Certainly not enough to justify his reputed 6 000 GBP per minute speaking fee. To wit: we need an open society, responsible leadership, and Africans need to take their destiny in their own hands. Blair is a consummate public speaker so his speech was graceful and witty as could be expected, and the audience of high-level business leaders was impressed. The humorous manner in which he responded to his critics, including Tutu, was a model of diplomacy and could teach South African politicians a thing or two about the art of the stylish retort. On questions about his invasion of Iraq, he was smoothly evasive and showed no willingness to debate any of the key issues. But what he did say – during his tenure as prime minister and again in the BBC debate on poverty – leaves me with a deep fear that the idea of “responsible and sensible” government might be displacing that of “accountable” government. That would be a profoundly undemocratic version of leadership.